An aluminum cook pot to suit your needs! 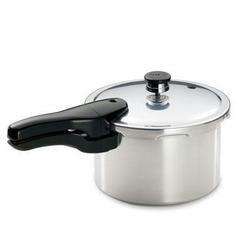 This Presto 4-Quart Aluminum Pressure Cooker transmits heat quickly and evenly for good healthy meal results. Use a pressure cooking pan to shorten preparation time and help preserve vitamins and minerals. Aluminum material Conducts heat quickly and evenly for even faster cooking results. Black handle Is tapered for a sure grip and easy lifting of hot pan. Pressure cooker Can be even faster than a microwave for some foods.